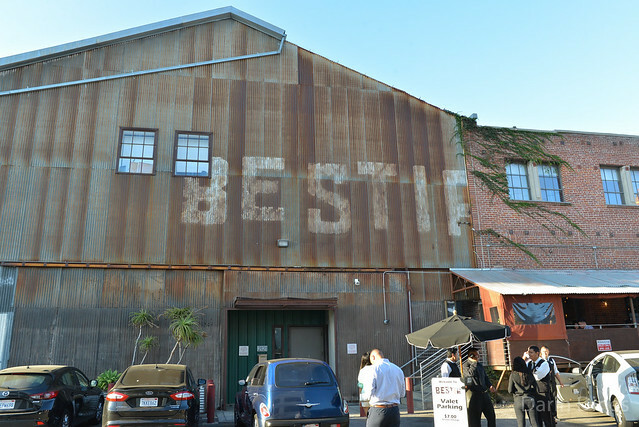 Open almost three years now, Bestia continues to be a restaurant I frequent. I’m not alone; it seems to be as popular as ever. I consider it one of my favorite restaurants in the city and am lucky to have it in close proximity to me downtown. 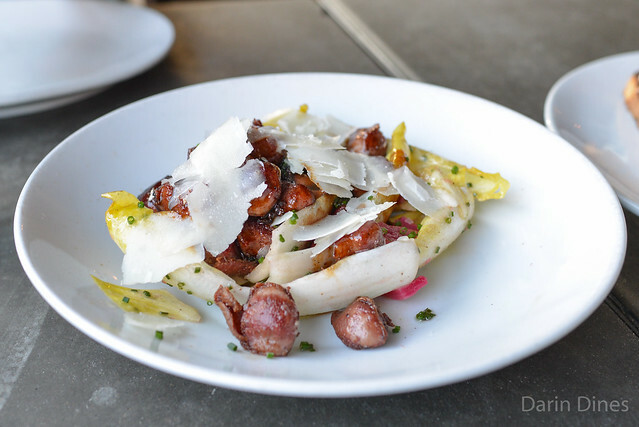 The menu at Bestia changes often, rotating based on the seasons and ingredient availability. However, there’s always a handful of menu staples as well; every time I visit, I get some of these old favorites as well as some new ones. This post recaps three previous visits. 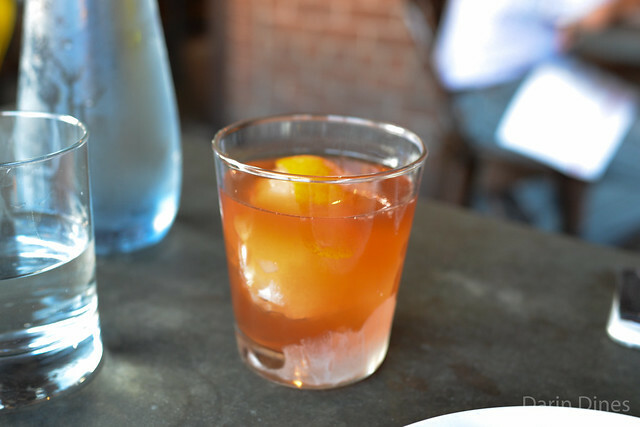 Chef’s Old Fashioned. lardo infused bourbon. hickory smoked sugar. angostura bitters. salt tincture. 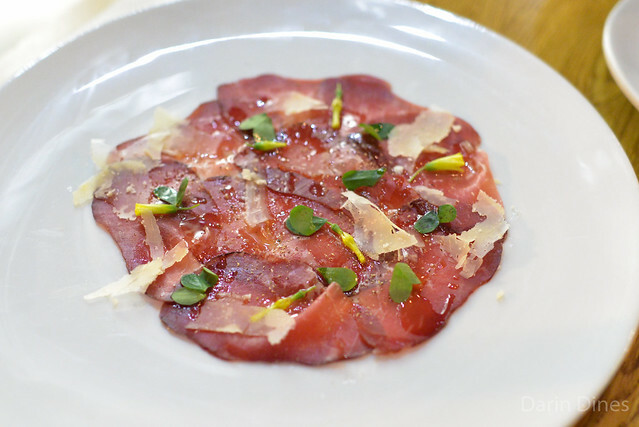 House Cured Bresaola. wood sorel. franzedaz. black pepper. lemon juice. 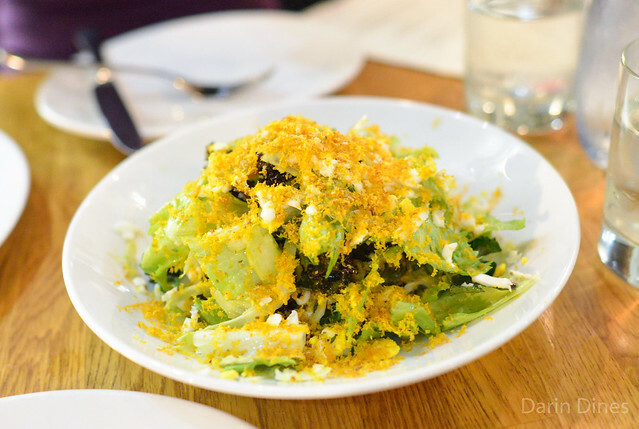 Smoked Sea Urchin Bottarga & Chicory Salad. golden raisins. sieved egg. pickled chilies. oregano. Sea urchin was subtle in this salad featuring bright greens. 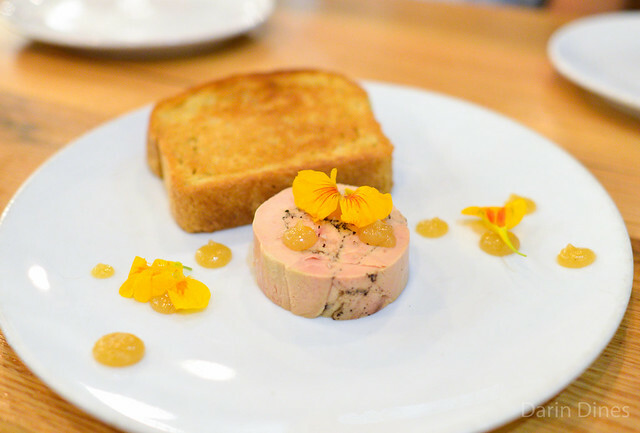 Foie Gras Terrine. stumptown coffee. spices. lemon paste. sea salt. brioche. 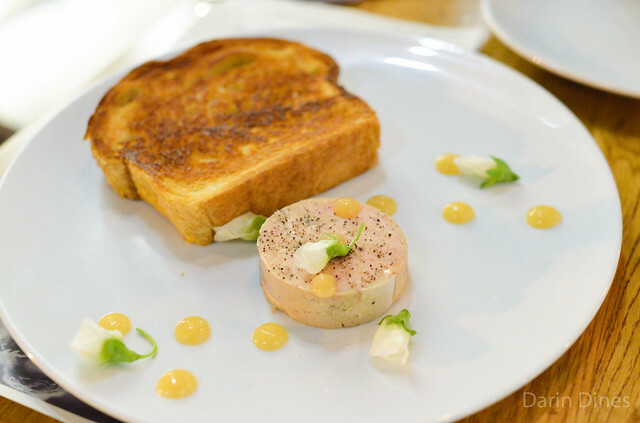 I first had this soon after the foie gras ban was lifted earlier this year. The terrine was rich with subtle coffee flavor, while lemon purée provided some fresh acidity to balance it out. Smoked Whitefish Crostino. dill. potatoes. scallions. fresno chillies. celery leaf. 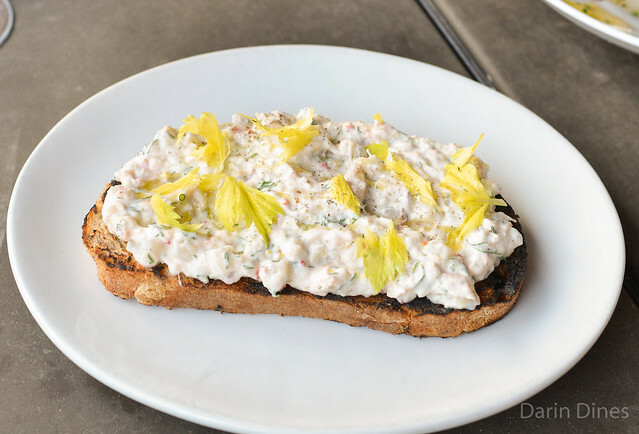 House smoked whitefish was smothered in plenty of creme fraiche and dill on crusty bread. Mussels and Clams. housemade spicy ‘nduja sausage. fennel seed. preserved orange. grilled bread. The spicy tomato sauce is what made this dish with sausage and seafood flavors. 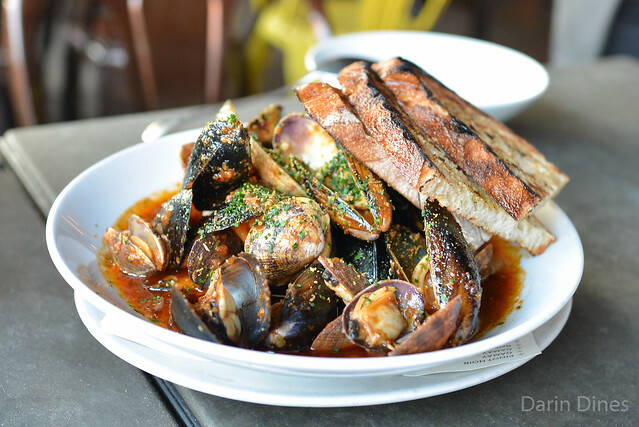 Sweet mussels and clams were cooked just right; make sure to ask for extra bread to soak up the extra sauce. Pan-Roasted Chicken Gizzards. roasted beets. belgian endive. aged capra sarda. Confit then fried, these gizzards had a tender yet crispy texture with plenty of flavor. Endive, beets and a light vinaigrette offset the richness. Cavatelli alla Norcina. ricotta dumplings, housemade pork sausage, black truffles, grana padano. 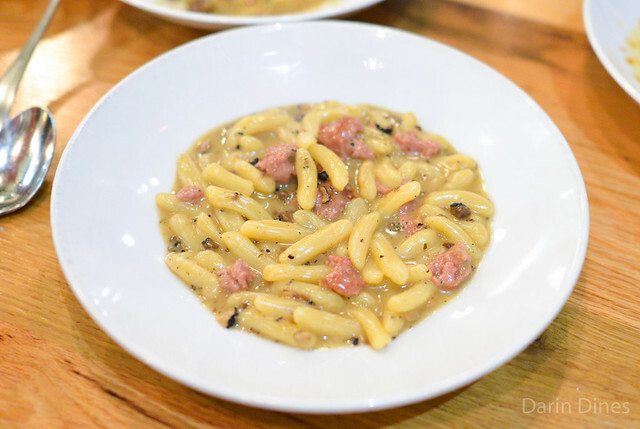 Another strong pasta, this one featured cavatelli with housemade sausage and black truffles. Great textures. Spaghetti Rustichella. sea urchin. garlic. calabrian chilies. squid ink bottarga. breadcrumbs. Always a favorite and a menu staple. 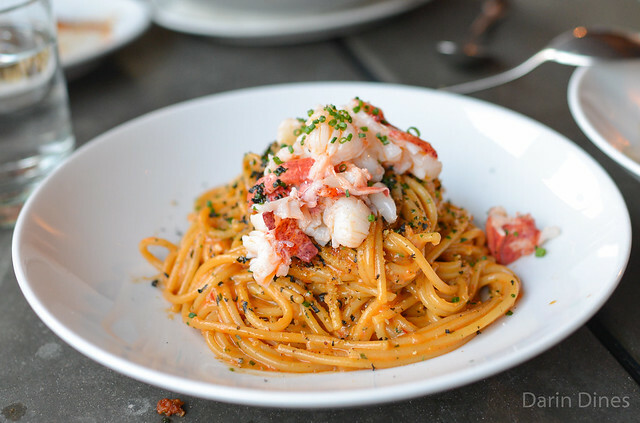 On the most recent visit, this one featured sweet Maine lobster on top. Too much deliciousness. Tagliatelle alla Zefferano. pork ragu. speck. fried sage. grana padano. 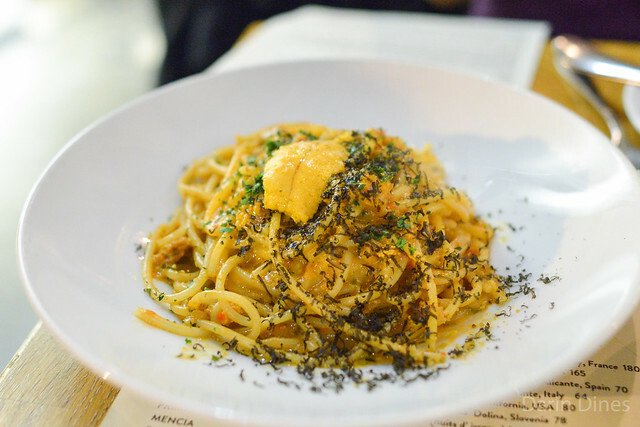 This was another pasta that’s always a favorite, though it comes and goes from the menu. 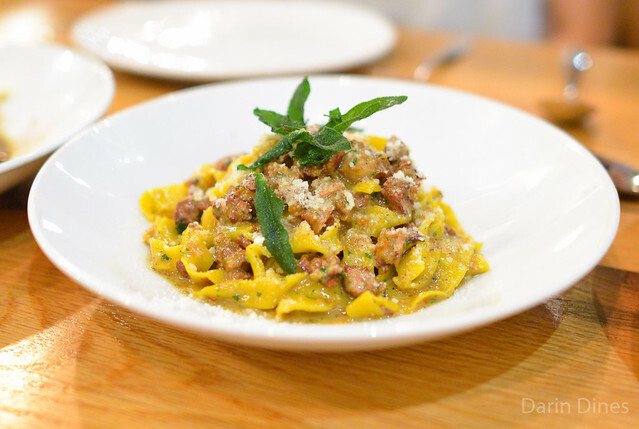 It’s got such a meaty depth of flavor with addictingly chewy pasta. Bucatini alla’Nduja Affumicata. smoked spicy ‘nduja. tomato sugo. marjoram. burrata. breadcrumbs. I’d never seen this pasta before; this was my first time trying it. 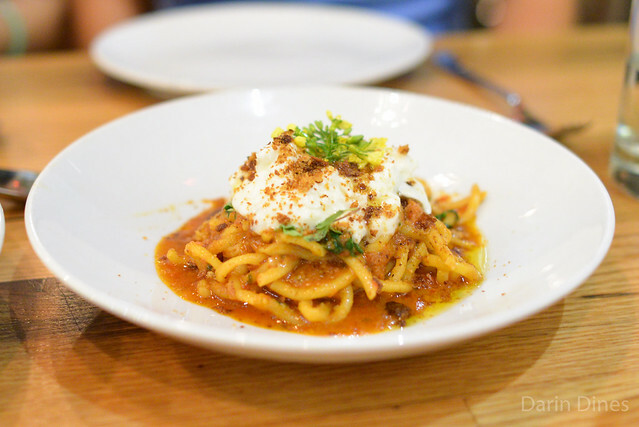 Bucatini had a nice texture with extra richness from cool, creamy burrata. Pistacchio Pici al Sugo di Agnello. lamb ragu. saffron. capra sarda. fig leaf. ground pistachios. 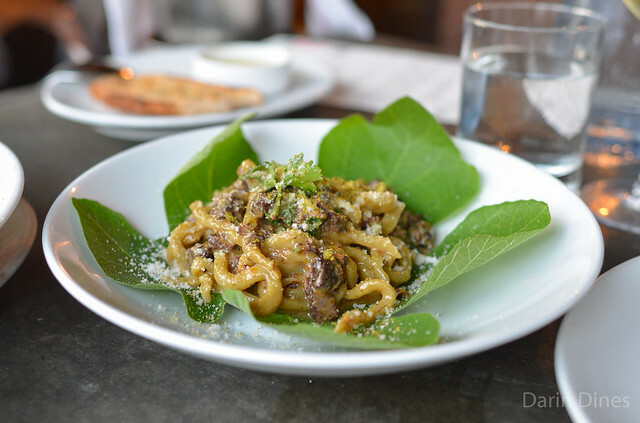 This pici with lamb ragu was a new one for me. Chewy strands of thick pasta were bathed in the rich sauce with a subtle nuttiness from pistachio. Another very good one. Valrhona Fair Trade Bittersweet Chocolate Budino Tart. salted caramel. cacao crust. olive oil. sea salt. 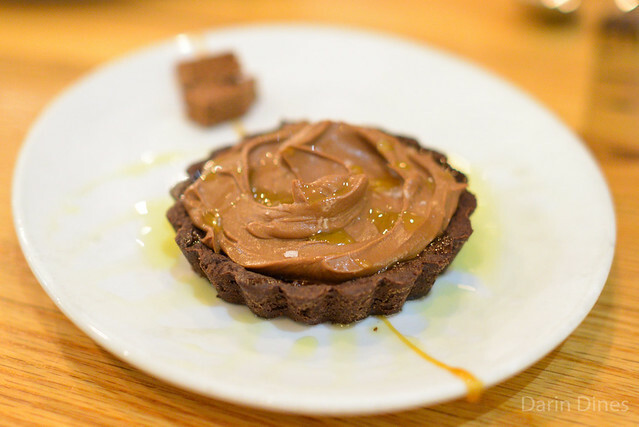 Chocolate tart came with a crumbly crust, creamy chocolate and drizzled caramel. Flakes of sea salt were really a difference maker. 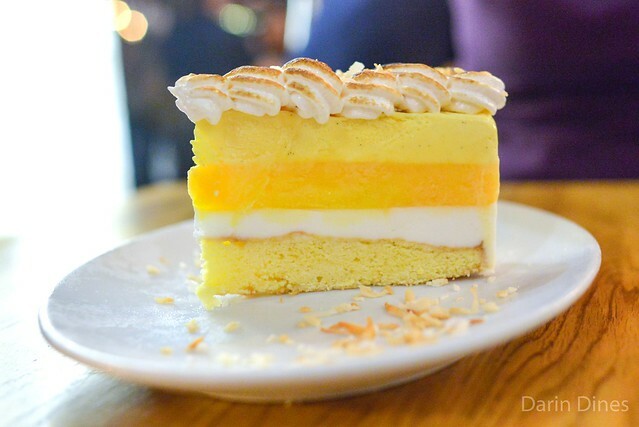 Creamsicle Torte. buttercake, coconut. sour tangerine. meyer lemon. italian meringue. toasted coconut. The creamsicle torte was just as advertised with flavors really reminiscent of the classic dessert. Nectarines and Cream. 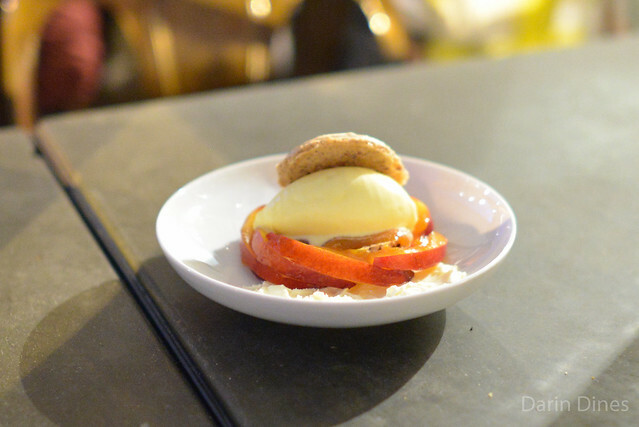 sweet cream ice cream, cinnamon pecan macaron, roasted peach caramel, clotted cream. A variation on a sort of peaches and cream, this dessert highlighted the season’s stone fruit with clotted cream and ice cream. Bestia continues to consistently put together some of my favorite meals. The highlights for me are the pastas with the small plates a close second (mussels & clams, chicken gizzards, and I miss the beef tongue). Pizzas and main courses are good as well but I don’t often order them. Eep! This is the reason I most want to come back to LA. I absolutely loved my meal here – it was one of the most memorable I had on the trip. so-very-good.